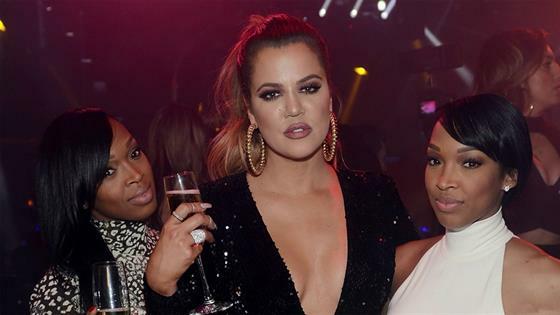 Khloe Kardashian got the party started for two very special ladies—her BFFs! The reality star jetted off to Las Vegas this weekend in honor of Malika Haqq and Khadijah Haqq McCray, two of her longtime besties. The twin sisters turned 36 on Sunday as they kicked off a weekend celebration on a private jet to Sin City. KoKo had custom donuts spelling out their names waiting on the plane as the twins kicked off the festivities on board with a toast. The trio also documented on social media the luxe suite they called home for a couple of days, including custom balloons spelling out "Happy Birthday" and their names as well as views of the Las Vegas strip. Not too shabby! As a source noted to E! News, "All of the women are in a very celebratory mood." Of course, the celebration didn't just take place in their hotel room. According to the source, the ladies ventured out for a bit of gambling at the casino before getting ready for dinner at Hakkasan on Sunday night. Around 11 p.m., the group enjoyed their meal, topped off with a pink cake for the birthday gals and a bottle of Don Julio 1942 to get the party started. After dinner, they headed to Hakkasan nightclub, where the sisters danced the night away at a VIP table close to the DJ booth. The club helped celebrate the twins with jumbo-sized cutouts of their faces as well as another stylish cake. The ladies sipped on Don Julio 1942 and Moët & Chandon champagne using gold cups that read "Birthday Babes." Malika cheered on her man O.T. Genesis, who took the stage inside the club around 2 a.m. According to a second source, Khloe stuck with the girls and wasn't looking to meet any guys, but she did receive a ton of support from clubgoers who were cheering her on and waiving to her while screaming out, "We love you, Khloe!" Per the second source, the ladies continued to dance until around 3 a.m., when they headed back to their hotel. The reality star took to social media earlier in the day to celebrate her gal pals with photos of them all together over their many years of friendship. "Happy birthday @malika and @foreverkhadijah !! You ladies are so beyond special!! I thank God for our friendship daily! I hope you are blessed with every beautiful birthday to be better than the one before!! I love you both madly!" True Thompson's famous mom wrote to the twins. "We are going to have FUN tonight!" Judging by the photos, they certainly did. Take a look inside the party weekend with E! 's gallery below! The group jetted off to Sin City in style. The reality star spared no special detail while celebrating her gal pals' birthday on board. The sisters celebrated with sweet treats like customized donuts. No party weekend can begin without a toast! Inside their hotel room, the sisters were welcomed with custom balloons. The ladies were dressed to impress as they headed to the birthday meal. The guests of honor got to blow out the candles on a stylish cake. What birthday party would be complete without some late-night dancing...and jumbo-sized cutouts of your face?